Serving up tradition, one sip at a time. But most of all, T is for tea, which blends all of the above into the island experience of North Caicos Tea Company. Caicos Tea Company is a North Caicos venture which sells traditional bush teas and tea blends. It was created by Donna Gardiner as a way of preserving local culture and sharing the knowledge of the “old ways” on the island where she grew up. “I want Caicos Teas to represent the ‘bush tea’ tradition for those who can’t go out and pick leaves for their daily drink,” she says. 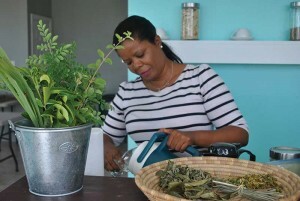 Donna Gardiner has turned the North Caicos tradition of “bush tea” into a new business venture. The business got underway in earnest at the beginning of 2016, although the idea had been growing for a while. As a child in Major Hill, Donna took the tea tradition for granted, commenting that her paternal grandmother, Susan Gardiner, simply assumed that no one left the house in the morning without first drinking some tea . . . at least three mouthfuls. Years later, she was surprised when others asked about the tea she brought with her to a former job. She began sharing with friends, then experimenting with dried plants, doing every step by hand: picking, drying, bagging and packaging. Caicos Tea Company was born. 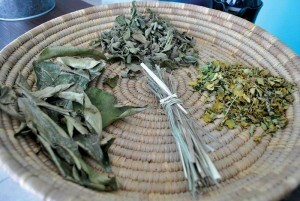 Local herbs from North Caicos are dried as ingredients for the teas. Most people make their own bush tea from fresh plants, so figuring out the drying process was a matter of experimentation. “When they’re drying, they all behave differently,” she says. Fever grass (also known as lemongrass in other cultures), for example, is easy to work with when green, but harder to handle when drying has made the leaf edges sharp and tough. “Moringa has been the hardest teacher,” Donna notes, recalling an entire batch that had to be thrown away because of improper drying. Caicos Teas are dried naturally with sun and air, so the weather comes into play. Mint: Many cultures acknowledge the soothing qualities of mint, making it a natural for problems with digestion and other stomach ailments. Fever grass: Known in some other cultures as lemongrass, fever grass gets its TCI name from its ability to cool the body and bring down a fever. It is often used to ease the symptoms of a cold or flu. Moringa: Sometimes referred to as the “miracle” tree, moringa is used for colds, fevers and blood pressure. Every part of the tree is used for something. The teas Donna makes are from the moringa leaves, but she is now experimenting with its flowers. Moringa has a very strong, distinct flavour, so she pairs it with mint. Hi. When I was in T&C main island in May, I was looking for your teas in the main supermarkets and couldn’t find any. Is it sold anywhere in the US or on Amazon? Or another website? I am looking for the soursop and fevergrass one.